Colonial Williamsburg is one of those wonderful historical places which is a must see. Though it was very difficult to get around on my electric scooter and hard to get around in a wheelchair. If you have limited mobility, I suggest you get a wheelchair, as the walks are long and the terrain uneven. Now, that I have given you your cautions you must visit. The visitor’s center, which is located on the outskirts of town, is large and very impressive. If you are a history buff you could spend weeks at Colonial Williamsburg, but if you want to make it just a one day stop, then start early in the morning. There is transportation from the visitor’s center to the center of town but this is for those with some mobility. Otherwise, you can use the one of the many parking lots surrounding the town. It is truly amazing how this town has been restored. You feel that you are back in a different time when you enter Williamsburg, seeing the costumed volunteers and the buildings. 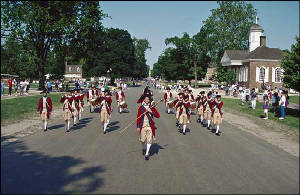 Williamsburg was the thriving capital of Virginia when the dream of American freedom and independence was taking shape. The colony was a rich and powerful land stretching west to the Mississippi River and north to the Great Lakes. For 81 formative years, from 1699 to 1780, Williamsburg was the political, cultural, and educational center of what was then the largest, most populous, and most influential of the American colonies. It was here that the fundamental concepts of the republic — responsible leadership, a sense of public service, self-government, and individual liberty — were nurtured under the leadership of patriots such as George Washington, Thomas Jefferson, George Mason, and Peyton Randolph. Mr. Rockefeller gave the project his personal leadership until his death in 1960, and it was his quiet generosity of spirit and uncompromising ethic of excellence that guided and still dominates its development. He funded the preservation of more than 80 of the original structures, the reconstruction of many buildings, and the construction of extensive facilities to accommodate the visiting public. What I found when I visited Williamsburg was America’s past coming to life. It is a place to have fun and re-energize and re-connect with the history of America before the American Revolution. Williamsburg is one of the country’s oldest planned communities. In its shops, taverns, government buildings, homes and streets George Washington, Thomas Jefferson, Patrick Henry, George Mason and other Virginia patriots established the ideals of liberty, independence, and personal freedom. Most building will indicate how a wheelchair gets into the building by signage outside. Some buildings seem not to be accessible or at least I couldn’t see how. What I suggest is enjoy what you can, take your time and allow your mind to go back in time and savor this wonderful place. Do not get frustrated but be prepared that this is not like going to Walt Disney land with pavement and convenience. Take it in as another experience and enjoy. I also recommend if you are going to Colonial Williamsburg that you take a day or two and go to Busch Gardens Williamsburg, a real fun interesting place the whole family once gain can enjoy. Check out my article on Busch gardens – Williamsburg.